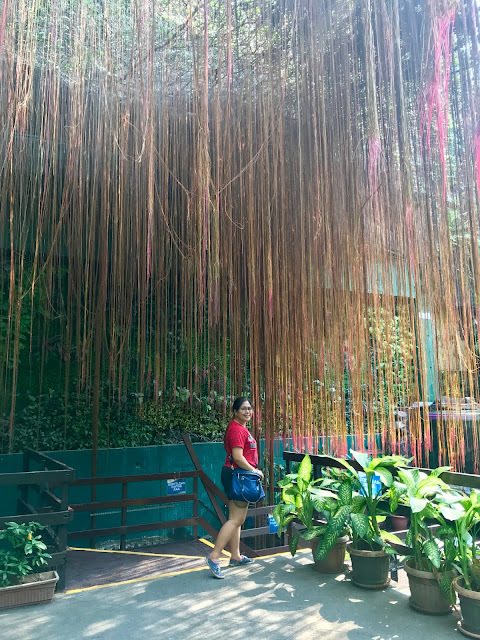 Since I am already staying in the Province, normally we scheduled additional plans whenever we are going to Manila so that we can maximize our stay there especially when we will be running some errands that will just consume a little time, we find time to either meet our friends or schedule an activity. Last week, we went to Manila Ocean Park and luckily we get to explore it with one of our good friend, Jayson. 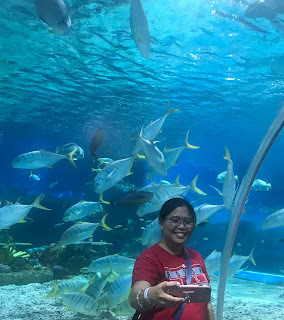 The three of us are beach lovers and of course marine living things, however due to some busy schedule we couldn't schedule an out of town trip so we decided to visit Manila Ocean Park. 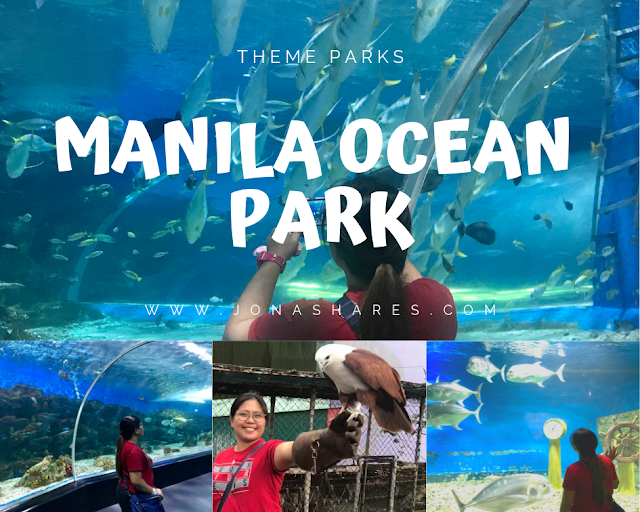 How to go to Manila Ocean Park? Manila Ocean Park is located behind Quirino Grandstand along Manila Bay. If you are familiar with the place, you would know that going to Quirino Grandstand requires a walk along Rizal Park. You can also take the LRT (Light Rail Transit). Get down at the (UN) United Nations Station and take a walk through Rizal Park and Quirino Grandstand. However, if you don't want to walk, you can ride the taxi to get inside the theme park. My friend took the LRT while since me and my husband stayed in the nearby area, we just walk and meet my friend at the theme park entrance. What ticket did we buy? Got ourselves the Marine Voyage package under TravelBook.ph, it's probably the best ticket as you get to enjoy almost all the attraction inside the Manila Ocean Park. Here are the list of free passes for the ticket that we availed. Starting out our fun day at Manila Ocean Park! 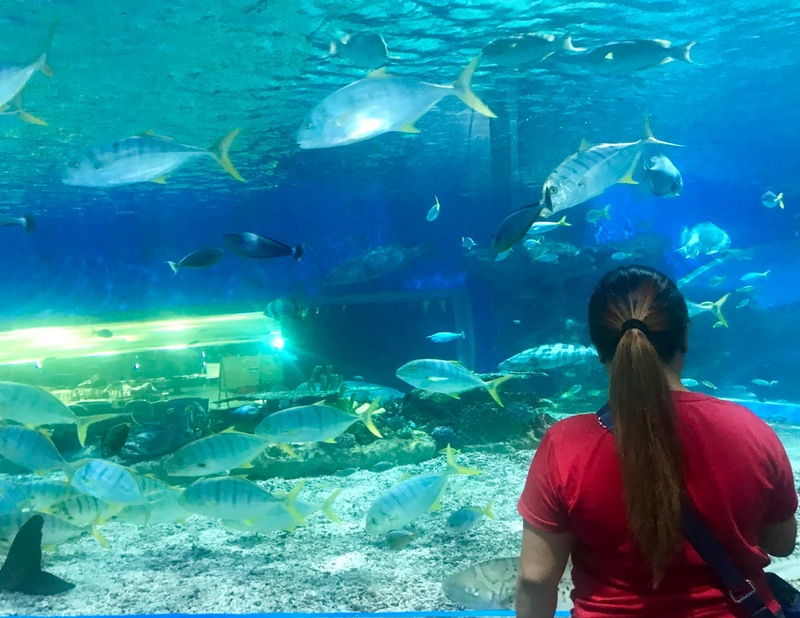 Oceanarium is one of the most sought after by visitors. You get to feel that you are underwater while walking at this twety five-meter long tunnel with a two-twenty degree walkway. The most picture perfect spot I got since there are so many visitors. 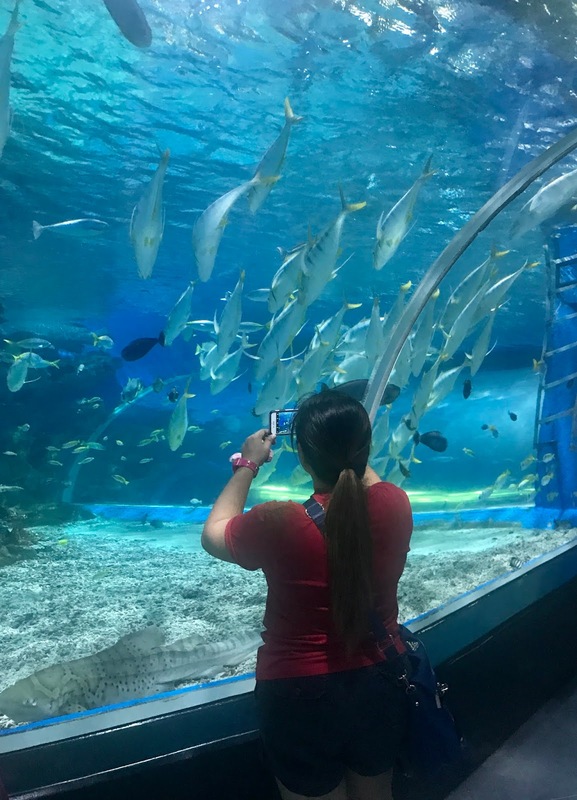 You will get to see the stunning displays of marine life in the ocean depths through Asia’s largest underwater viewing tunnel. 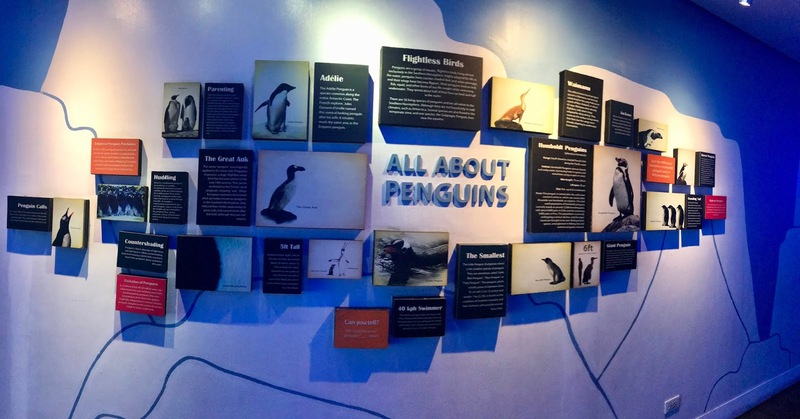 Be surrounded with over 14,000 sea creatures coming from the Philippines and Southeast Asia. It has more than five thousand fishes in the tank that are mostly found in the Philippines water. Trails to Antarctica features cool zones including a walk-through exhibit where you can learn more about the distant, frozen wilderness and see Humboldt penguins live. 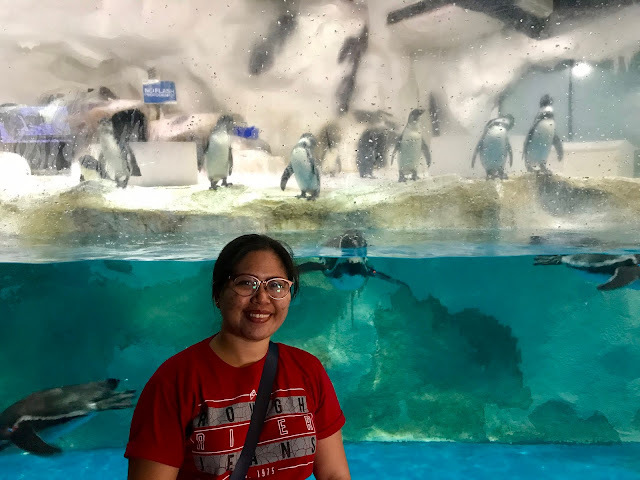 It's my very first time to see real penguins! Birds of Prey Kingdom also makes our day a memorable one. Close encounter it is! The Birds of Prey features one of the most stunning coastal raptors in the Philippines, the Brahminy Kites (Haliastur Indus) which is locally known as Lawin in Tagalog. We learned their characteristics and experience a close encounter with these winged wonders. They are really amazing!!! Make sure to have the theme park Berds of Prey coordinator introduce the birds to you and also he would let you have a great experience with the fifity lawins living there. Get to see the sea lions show their talents as they entertain you during the show. 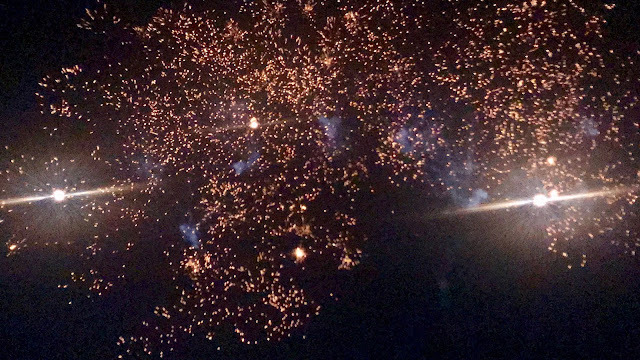 We only stayed in the side since it's still too hot during the show, this is the best shot I have. Haha! This one is an animated talking penguin. You get to experience a real time digital puppetry in a theatre setting. Selfie with taking Penguin after the show. Did you see Mr. Penguin and the three of us? Haha! Check out the largest toy collection of your childhood superheroes in the Philippines. Kids and the kids at heart will surely enjoy the Supertoy Collection! Hubby is so serious looking at the collections. Haha! Got to see the jelly fishes in a colorful setting. Also music is being played here that makes it more beautiful to watch the jelly fishes in the dark room. Learning about jelly fishes by looking at this. See how beautiful these jelly fishes with interchanging colorful lights. We end our Manila Ocean Park with it's Symphony Evening show. 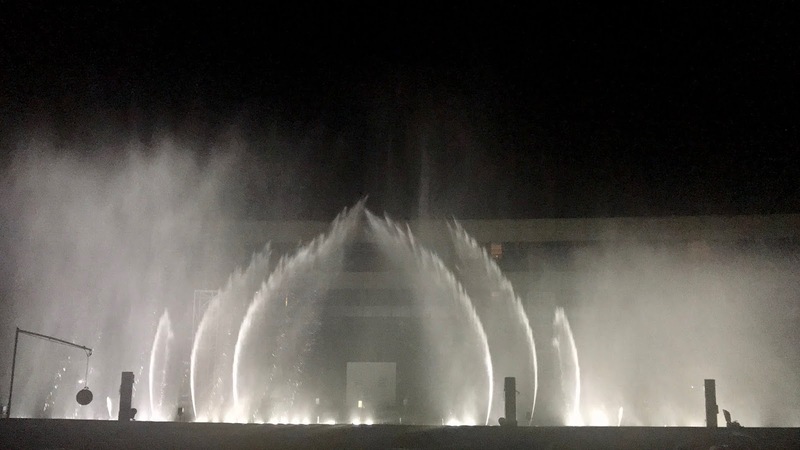 You will get to see a combination of lights, water screen projections and pyrotechnics while watching it. 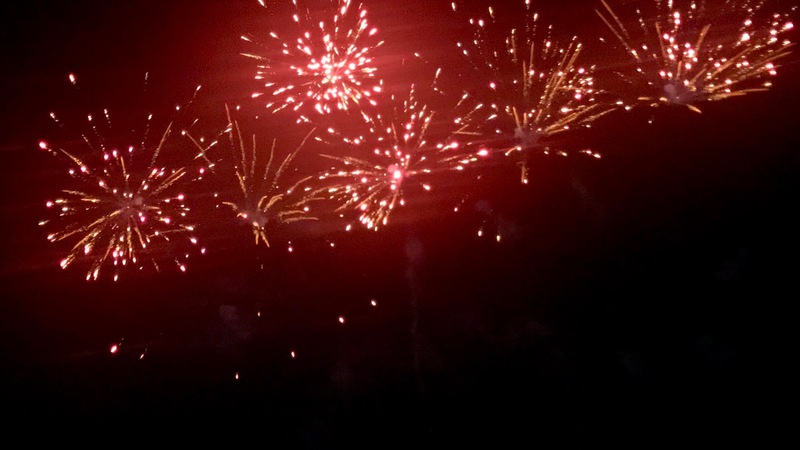 Plus awesome fireworks display to surprise their guests. 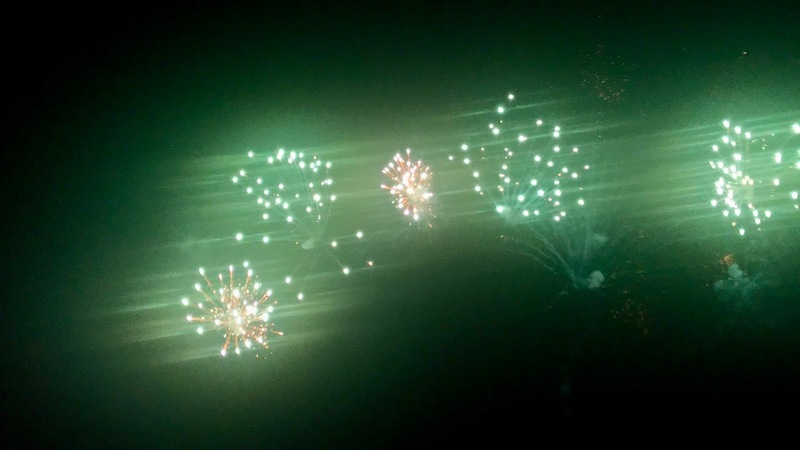 We got to see this when we are already out. Cool rides, right? Maybe next time, will try this out. We were not able to see all the attractions as we quiet enjoy the Ocenarium a lot. Haha! But another well spent day! Indeed we had an amazing day! Please take note also of the Attraction Schedules by checking it out on their website or facebook page. I love visiting ocean themed parks and looking at all the different fish. 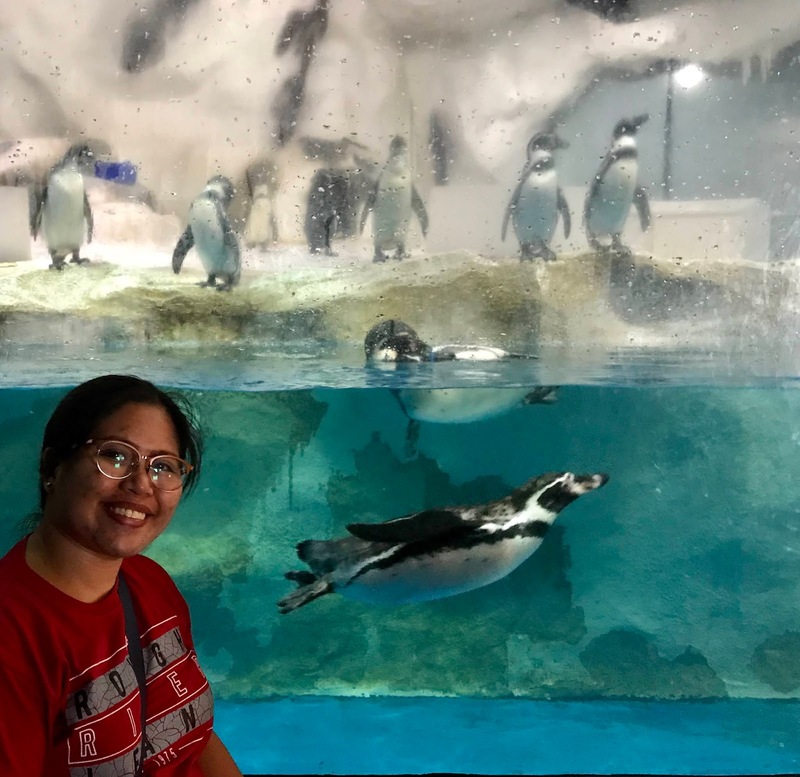 I also enjoy watching the penguins and I would love to visit Manila Ocean Park. What a fun day this would be! Talk about an AMAZING aquarium!!!!!!! I went to one in San Diego and it was TERRIBLE! I need to go to a GOOD ONE like this one because hot damn, it looks like quite an adventure! I think you could spend a week in that aquarium. I love the penguins and the sea lion show also looks like a can't miss show. My kids always love seeing wildlife and marine animals up close. We always visit our local aquarium at least a few times per year. 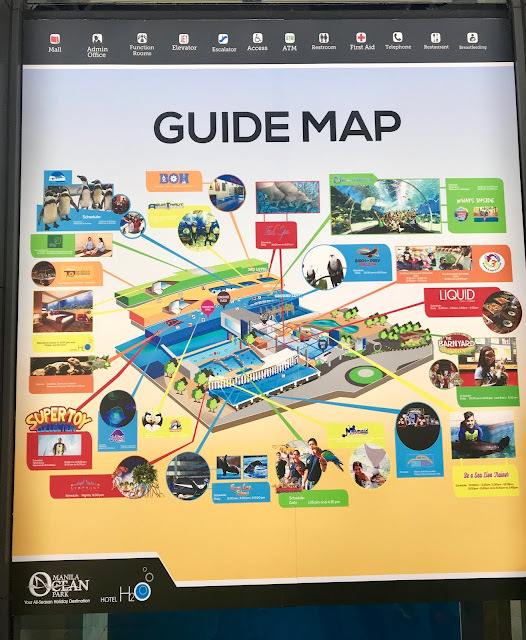 This ocean park sounds awesome!! That looks like a lot of fun. I always like seeing penguins, they are just so cute. Wow this looks like such an amazing place to visit. My eldest is penguin obsessed so would love that part so much. That sounds like a great way to spend the day! I love aquariums, and I seriously could spend all day in that one. This does look like a great place to hang out! I'll have to go here one day. I just love those neon rides. So cool. Sounds like a bunch of fun. We always enjoy going to parks like that here in the United States as well. This sounds like such a great place to go and explore. I love how up close it gets you with the sea creatures. That tunnel looks amazing! That Oceanarioum is gorgeous! I would love to visit there one day!! This will definitely make it on the bucket list. This looks like so much fun. What an awesome place. This looks like an amazing experience. I would love to visit on day with my family. That owl! They look so innocent but they are calculating animals. Good for the environment. I love the aquariums! That does look like a lot of fun! These photos are so beautiful. That's awesome that you got to hold that bird. That is always something I've wanted to do. Oh my gosh! I LOVE Oceanarium. There is a restaurant that has an huge aquarium like that in the Maldives. I'm visiting the Maldives in April and would love to be able to eat under the sharks and rays! This looks like such an awesome place to visit. Love the pictures you shared.